We’ve been here one week and three days, and I already feel as though we have more stories to tell than this little website could hold. We are learning so much about church planting, ministry and life here in New England. It’s difficult to explain just how full these last few days have been, and just how grateful we are for each of you and our Almighty God, but I’ll try to do my best!! First of all, it’s important to clarify that I got the “all clear” from the doctor. After my medical testing came back negative, Rhett and I knew we could move to the Northeast in confidence, without a major stressor hanging over our heads. That was such a relief, and we are so grateful for the way your prayers made a difference in how we felt as we waited for test results. Thank you. Secondly, our trip out here was pretty much as good as it could get! We had no major issues, and besides a detour 30 minutes off the highway to a semi-sketchy motel for the night, nothing was too inconvenient or surprising… I take that back. A twenty-six dollar toll fare was surprising. New England is full of toll roads. When we pulled into our new apartment, we had a crowd of about fifteen people from the church waiting to help us unload our Penske! In quite the flurry, the truck was completely unloaded after only fourteen minutes! Josh, the lead minister at Movement, timed it for us. We were then able to talk with our new church family for a while and spend some time getting to know them. We felt so incredibly loved by the way they showered us with everything from home grown herbs to delicious local pizza to fresh flowers, gluten free brownies and numerous gift cards over the next few days. Movement, thank you. Thank you for welcoming us with open arms, trusting hearts and so much incredible generosity. You already mean the world to us. Since then, we’ve been able to set up our little home, figure our way around (through lots of turning around), attend meetings and jump head first into the community. Our first day in the office, we were able to sit in on a meeting with a wonderful lady who recently decided to give her entire life to Jesus and get baptized. She and her family started coming to Movement after a literal sign got stuck in the bushes of her front yard! It was an honor to hear her share her heart. Between several other meetings, soccer practice and games for Rhett, trying and failing to set up a local bank account (apparently proof of residence is necessary? I should have known), and unpacking lots of random boxes, we have also been able to share meals with so many gracious people from Movement. This has been a blessing for lots of reasons. It’s allowed us to explore our new home, to meet and get to know so many wonderful new friends and to not have to worry as much about cooking as we get settled in. To those of you that have opened your home, brought food over or shared a meal with us: Thank you so much. Thank you for your kindness and hospitality. We have so enjoyed spending our evenings with you, and we’re looking forward to many more! Finally, we’ve also been able to start experiencing life in a small town between two larger cities here in New England. Merrimack basically runs into Nashua and Manchester, both of which are pretty big. On Saturday, we went to a community yard sale before crossing the street and attending a book sale at the library. Sunday, we drove into Nashua and had the most amazing time at an Egyptian Festival held at the Coptic church. We ate shish kabobs, rice pilaf, tabouleh and stuffed grape leaves as we talked with some new friends of ours who immigrated to the United States about two years ago from Egypt. They shared their experiences with us, growing up and living as Christians in a country where Islam is the dominant religion. We also shared a photo and swapped Facebook friend requests so we can stay in touch! There are so many incredible things happening here. We have learned and experienced so much in these past few days! There is a significant need here for people who know, love and trust Jesus Christ to spread His Light and speak His name. Thank you for allowing us to do so. We couldn’t have made it this far without many of you, who have prayed for us, followed us and supported us in so many encouraging ways. Thank you. Jesus is moving powerfully to change lives in the Northeast, and He is using people like you and me to do so. Thanks! Yummy gluten free brownies from a sweet new friend of ours. Delicious food from the Egyptian Festival in Nashua. Rhett is a coach for the high school soccer team! According to the plan, we were to have spent yesterday packing up a truck and today on the road. Our plan was to pull into Merrimack tomorrow afternoon and begin a new season of our lives together. If I’ve learned anything, though, it’s that plans change- often. Instead of packing up a truck, we spent part of yesterday in a doctor’s office. A surprise medical issue came up in the past few days, and thankfully I was able to get in to see doctors and have tests run quickly. It probably isn’t anything serious, but we would much rather be safe than sorry! Because of this issue and the subsequent testing, we decided to postpone our cross country move for another week. We should know for sure whether follow up treatment will be required or not by Monday or Tuesday. Because of the uncertainty of this time, we felt it was best to wait a few days before jumping into this huge transition! Having relatively invasive tests done is stressful enough without experiencing everything that goes along with a major move, as well. The team at Movement has been incredibly supportive and loving as they’ve prayed for and encouraged us. We are so grateful to be joining their family! Making this decision was difficult; we are anxious and excited to move to Merrimack, start our ministry at Movement, settle into our new home and our new roles and meet our new friends. We really didn’t want to have to push it back. However, we feel confident that we made the right choice to stay in Indiana for a few more days. Six months from now, these few days (hopefully!) won’t matter in the grand scheme of things, but right now they feel pretty important. God has been so faithful over the course of this season of raising support and trying to figure out what we’re supposed to do and where we’re supposed to go. Over these past few days, He has continued to prove His faithfulness by comforting us and providing us with exactly what we need. Romans 8 has been my anthem, as “I am convinced that neither death nor life, neither angels or demons, neither the present nor the future, nor any powers, neither height nor depth, nor anything else in all creation, will be able to separate us from the love of God that is in Christ Jesus our Lord.” Sometimes, His love is even more evident in times that seem threatening. Perhaps, as I am being convicted of, we are better at paying attention to Him when the future seems scary. Please join us in prayer as we await test results and navigate the next couple of days. As of now, the plan is to leave Indiana next Friday and arrive in New Hampshire on Saturday. Please pray for our travels and our time settling into a new home. Please pray for our hearts, too, as we rest in God’s peace and trust in Him. We are so grateful for each of you. Thank you for reading our posts, for reaching out to us, for encouraging, praying and supporting us. Your love means the world, and this wouldn’t be possible without you! Thank you for letting Jesus use you to show his great love to us. When we first got married, Rhett and I opened up two savings accounts. One was for emergencies, and one was for travel. We put most of our money away into our main savings account, but we made sure to set aside some money for travel whenever we got paid. At the time, we didn’t have any specific plans for traveling. We just knew it was something important to us and something we wanted to start saving for. Honestly, it has been one of the best decisions we’ve made. It’s allowed us to spend a few weeks traipsing across national parks this summer. We’ve definitely been traveling cheap; tent camping and eating lots of sandwiches and bowls of cereal, but the memories we’ve made and sights we’ve seen are absolutely priceless. Already, we’re beginning to dream about what our next trip might be. Sure, it’ll take a few years of saving, but what about Europe? We have friends we could stay with! Or maybe Alaska? Neither of us have been there yet.. there’s something so beautiful about taking time to dream and letting our hearts become captivated by thoughts of what might be. I think God created us to be dreamers. We’re created in His image, and if He didn’t dream up Glacier National Park while forming it into being, I’m not sure how it got to be here. I see us as dreamers when we share our visions for what our churches and communities could become. I see us as dreamers when we pray, humbly asking God to make our dreams come to life, whether it’s for peace in relationships or renewed health or a renewed heart. Prayer is lots of things, and sometimes it’s bringing our dreams to Jesus and asking Him to speak into them. Sometimes, though, when we do this, Jesus changes our dreams. Sometimes He dismantles them. Sometimes this hurts, a lot. Sometimes, like Abraham and Sarah in the Bible, He has us wait years and years before saying “yes” to our dreams. Sarah was an old woman before He finally granted her wish for a child! Even then, there were moments where that dream was threatened. Sometimes, dreaming can be scary, because it might be easier to imagine nothing at all then to get our hopes up without promise. Over the past year and lots of my life (yours too, probably), dreams have been dreamed only to be torn down and rebuilt. When I first left home for Ozark Christian College, my dream was to graduate single and move across the world to rescue men, women and children from human trafficking. Obviously, that’s not exactly how my life is panning out, and that’s probably a really good thing! Over my time as a student, God changed my heart toward community development, urban ministry and marriage. My dreams began to build around Soren Rhett Johnson and ministry with low-income neighbors right in my community. Still, though, I never saw myself working directly in a church. When I was offered a job working with a community development organization, I thought my dreams were coming true. But God, in His grace and love, is steering us in a different direction. Rather than returning to my family and hometown, a dream I had built, He’s leading us to a church plant in New Hampshire. Honestly, things with Movement started coming together before they became a hope in my own heart. This is and always has been His dream, as far as I can tell. He has also been the one building it back up in my mind and heart. Over these past few weeks of travel, He’s been answering my prayers by affirming this decision and giving me an immense amount of peace and joy concerning it. I’m dreaming about putting together our little apartment and lighting the sweet cinnamon candle my mother-in-law bought us from the Bishops Castle gift store in the San Isabel forest a few weeks ago. I’m dreaming about decorating a guest room so friends, family, travelers and who ever else might need it will have a cozy and restful place to stay. I’m dreaming about sharing coffee with new friends, worshiping with a new church body, finding creative ways to get involved with our community and having conversations about our great, dream-giving God with people who may or may not know His love yet. I’m dreaming about working alongside an incredible staff of dreamers who are pursuing God’s vision with passion and courage. God is in the business of giving and building dreams. Sometimes it seems as though He is forsaking our hopes and wishes, but more often than not, the cliche phrase “when God closes a door, He opens a window” holds true. However, we can’t put Him in a box. I think I know where He’s leading; it seems He’s affirming it, but if something falls through, does that make Him unfaithful? No. When He doesn’t clear a path for our dreams to come true, we can still trust Him, knowing that there is something He is calling each and every one of us to be and to do. Our call to love Him and love others is unchanging and applicable in every context. Friends, what are the dreams and wishes you’re holding on to? Have you laid them before our God? Is He building a new dream in you, or gently (or not so gently) taking apart an old one? Please feel free to leave a comment below or email us! As always, we love you and we are praying for you. Over the many travels I have had the privilege of taking theses past few years, I have seen and experienced lots of wonderful things. Each city, region, or national park I’ve been to has been its own unique concoction of God’s imagining, but there are some things that every place has in common. One thing I have noticed in particular is that everyone and everywhere has news. The Bible says that on the sixth day, God created Adam, and I’m sure that soon after, Adam was asking about the making of this world and God was telling the news. Ever since, all of humanity has been obsessed with news, from the battle of marathon, to Paul Revere’s midnight ride, to the local gossip of every village since Adam and Eve. News has always played an intricate role in the story of humanity. (Frankly, news IS the story of humanity). And this is not a bad thing! As humans created in God’s image, we are hard wired to aspire to reflect God’s all-knowing quality, His “omniscience”, by striving to know about the world around us. It’s no coincidence that our charge as Christians is to spread the “Good news”. But I have noticed over the last two weeks of being largely out of touch with the news, just how quickly news happens in today’s world, and just how easy it is to drown in news that sows fear instead of the hope of the Gospel. My mom has been my messenger, texting me about the days events for me to receive every time I happen upon service. Every few days I get her updates and it’s made me realize just how fast our news cycle is in 2017. Between updates, stories are born, dominate TV and social media, and die within 24 to 48 hours. The term “15 minutes of fame” has never been more literal! I’ve been receiving these updates all while spending time seeing the glory of God’s creation in places like the snowy peaks of the Grand Tetons, the awesomely weird mud pots of Yellowstone, and the stunning “Going to the Sun Road” in Glacier National Park. I’ve learned that information hasn’t always spread as quickly as it does now. On our last night in Glacier, we were able to sit atop the mountains and view the wonders of the night sky with several local astronomers. While taking in the stars, one astronomer noted that this was the same view that virtually every human being had each night up until about 150 years ago. Isn’t that incredible? I was reminded of the unchanging nature of God. Every night He puts the stars on display to show us how BIG He is and how small we are. How much He must love us to go to the trouble of giving us such a view! Even though our God is unchanging, we tend to so often get caught up in the world’s ever changing and always incredulous news. Whether it’s on the tv, or in the work place or family, we spend so much time and energy worrying about news that we forget what’s important: God’s news. Jesus came to Earth to spread the good news about the kingdom of God, and after His resurrection, He charged us to go tell the same good news, and for the last 2,000 years, that news story hasn’t changed, it hasn’t gotten tired or become old hat, and it hasn’t lost one iota of it’s power! The one who broke this story also died for it, and it still did not change. He then conquered sin and death for it, and still it has not changed. The story has been passed to us over two millennia and it has come to me without changing. No, just like the stars in the sky, I did not just discover it; rather, it has been making it’s way to me since the dawn of creation. For that reason I will do just as so many others who heard before me. I will tell others, I will live my life in light of it, and, one day, I will die for it. Praise be to our unchanging God, who has not left us out of the loop, but has brought us in, by His grace, to an understanding of the truth through the good news of His son, Jesus Christ. Amen. If you would like to join us in spreading His news through prayer or financial gifts, please click here to join our team! A few months ago, I got a text from Rhett, with a link to the website that you are on now, explaining to me that he and Elisa were starting a blog, and that they wanted me to look it over before they officially launched it. So, I opened it up and looked around, and for the most part really liked what I saw. There was just one problem: I thought the title was really weird. After looking at the word for a long time, I realized that the reason why I thought it was such a strange word was because it was not a real word. This lead to a series of voice memos with Rhett and Elisa, where I tried to subtly hint at the fact that I didn’t like the title and that I thought that they should change it, either through adding a hyphen or something to make it look more like a real word. I can’t recall the exact timeline, but somewhere along the way in this conversation I realized that the whole point was that the R and the E stood for Rhett and Elisa (This is the part where my mom shakes her head in disappointment). So, I still wasn’t crazy about the title, but I let it go (It’s a good thing Rhett didn’t try to use his first name, Søren, because SEventuring just doesn’t have the same ring to it). Then, a couple weeks ago, I sat down to read all of their blog posts (I may or may not have neglected to read the blog posts about the life and ministry of two of my best friends for a prolonged period of time, but I’m not here to dwell on past mistakes). I have to admit, reading their posts from the past few months was a little weird for me. So many of the things that I was reading about were things that they had already told me about either through text, FaceTime, or in person, but reading their reflections instead of their reactions gave me the chance to slow down and process instead of simply reacting to a text message. For some reason, this reflection brought me back to that title, that I still wasn’t sure about, but this time, that RE (which I had tried to get Rhett and Elisa to change), suddenly jumped out at me. I realized that the prefix “re-” is a part of some pretty big theological words. Restoration (Acts 3.21, etc.). Reconciliation (Romans 5.11; 2 Corinthians 5.18-19). Redemption/redeem (Romans 3.24, Ephesians 1.7, etc.). Regeneration (Titus 3.5). Resurrection (Romans 1.4, all over the place). Probably some more words that I left out or forgot that you’re adding to this list. These words aren’t all tied to one root word in the original Greek or anything like that, but the amount of times that “re-” showed up in our English translations piqued my interests enough to look to see what was going on with these words. So, I opened my handy dandy Merriam-Webster app on my phone and searched “re-”. The first definition was simply “again,” but the second one, which jumped out me was “back to an original place, condition, etc.”. That’s when I realized that the reason so many of these words have this prefix is because that is what our God is in the business of doing. He takes brokenness, hopelessness, sin, evil, all the ways that we have messed up this world and he brings it back to an original place or condition. Even since sin entered the world in Genesis 3, and humanity rebelled against God and was no longer able to dwell in his presence because of the reality of sin, God has been at work bringing the entire world back to an original place or condition. That’s the message of the Gospel. That’s why the description of the New Heavens and the New Earth in Revelation 21-22 looks like the Garden of Eden, having no Temple but being filled with the presence of God, having rivers and waters of life, because the goal is for everything to be brought back to its original place, as God created it to be. Now, the pragmatist in me thinks that all of that is nice, but at the end of the day it’s just a happy coincidence, and it basically is. To my knowledge, Rhett and Elisa didn’t set out to make a theological point with the title of their blog. But while it’s unintentional, that doesn’t mean that it should be overlooked, because God is not looking to bring things back to its original place on his own; he’s doing it through the Church (Ephesians 3.7-13). God does not bring us back to our original place to leave us there, but so that we can join in with the advancement of his Kingdom. This is the work that God has called each and every Christian to, and for Rhett and Elisa this calling is taking them to New Hampshire. Through the various roles where they will be serving, they will be showing people how God wants to bring them back to their original place: in relationship with Him. But they’re not able to do it alone; none of us are. That’s why we need one another. That’s why we need to pray for one another, to encourage one another, to support one another in whatever way is possible. If you’re reading this, I assume that you’re at least interested in supporting Rhett and Elisa in some way. If that is what God is calling you to, I pray that you will jump in to support them in the incredible work that they are doing. But while this blog is about supporting Rhett and Elisa, they are only a part of something that is much bigger, and I pray that Rhett and Elisa, and the entire Church, would seek to join in with what God is doing to bring the entire world back its original place. AUTHOR BIO: Monte J. French has functioned in a variety of roles in relation to Rhett and Elisa, including, but not limited to, friend, roommate, podcast co-host, groomsman in their wedding, consumer of leftovers, text conversation partner, co-player of a variety of sports-themed video games, co-watcher of a variety of sports-themed television programs, metaphorical child, metaphorical father, metaphorical brother, and guest writer on their blog. He is the author of Only the Impassible God Can Redeem, a thesis that has literally been read by five people. In his spare time, he reads, peruses Twitter (@monteJfrench), and is told by Rhett and Elisa who he would be allowed to date in their eyes. He is very proud of Rhett and Elisa, and is honored to call them his friends. The first time I was in the Mountains of the wild west, my life changed forever. It was the summer before my junior year of high school, and events unfolded that would eventually lead my family and I to move across the country. For a while, the thought of visiting states further west than Illinois was scary and painful. However, after lots of healing and allowing God to build a new life in Indiana and in my heart, I began to again desire the adventure these mountains represent. Spending a summer in Yellowstone was time for Jesus to pour His grace and redemption all over a part of my story that had previously held hurt. He redeemed the West for me, and let my heart call this area of the country home for a while. Trust is scary. For me, it has taken time and time again of Jesus answering prayers and redeeming my brokenness for me to begin to give Him my trust. It’s easy to pledge my allegiance to Him when things are fine and dandy, but the moment I need to rely on Him to come through, my brain begins creating lists of reasons why I can’t trust Him, and why I’m much better off depending on myself. I was reminded that His provision does not depend on us sending out the perfect support packet or writing the best blog post. My worry over it all betrayed the fact that I was counting on Rhett and I to be able to say the right words or send the right things to motivate people to want to partner with us in prayer or financially. I was, and often do, trust in myself rather than in God. However, myself is not the one calling us to New Hampshire. Myself is not the one already at work there. Myself is not the one who will get us there or provide for us once we move. He is, though. He is big enough and good enough to move even the greatest mountains. All He asks me to do is trust in Him. Last Sunday, we attended a tiny church service in San Isabel. Our family quadrupled the normal size of the congregation, but it was wonderful to worship Jesus with fellow Christians. The pastor used an illustration that really resonated with me. He told a story about owning a large dog as a child, and how walks would turn into the dog walking him, rather than the other way around! How often we do this with God, he reminded us. We act like we can keep Him on a leash, pulling Him this way and that. Fortunately, that’s not how it is supposed to work, and thank goodness! When He is the one in charge, it is always best. God has used mountains to redeem me before, and as we’re in them again, I feel Him working more and more on my heart. He is leading me into deeper trust and reliance on Him. I might not be a high schooler in the midst of difficult transition, or a college student with no idea how her life would unfold, but once again I find myself in a place where I need to relinquish my control to the Lord. I am reminded that He meets me here, just as He’s met me everywhere I have been my entire life, and just as He promises to meet me in New Hampshire. Rhett & Elisa enjoying the beauty of Grand Teton National Park. Before learning about the physical, emotional and spiritual needs of New England, Rhett and I assumed it was like most other places where we had visited or lived. Sure, there had to be brokenness, but weren’t there a lot of churches available to help those who need it? Maybe not everyone practiced Christianity, but most are familiar with the basic story of the Gospel, right? We soon found out that the cultural landscape of the Northeast looks quite different from what we expected. Although the Northeast is the most influential part of the country, educating and raising many of our leaders, it is by far the least churched. There aren’t churches on every street corner; in fact, many of the ones that are there sit empty, even on Sundays. If someone wants to attend a Christian church, they can’t usually call up a neighbor or even check the White Pages to see what’s available. Most people don’t know much about Jesus at all, and there are lots of towns in New England that don’t have any Christian churches at all. In fact, Movement is one of only 24 independent Christian churches in all of New England (only 7 of those are located in New Hampshire). It is also interesting to learn about some of the physical needs in New England. Because of the incredibly high cost of living and lack of church support in the area, many hard-working people find themselves barely scraping by financially. People who could easily turn to a church-run program in many areas of the country to meet their physical needs simply do not have that option in New England. Unfortunately, issues such as the opioid crisis has caused the foster care system to place children in homes that are already over capacity, if they’re able to be placed at all. At first, this was hard for Rhett and I to even wrap our minds around, after spending most of our lives in the Bible Belt! But, the more we learned, the more we felt God stir in our hearts a passion for the people who don’t know Him yet in a part of the country many have long written off as being too difficult to minister in. He has opened this door for us to be involved in a New England church plant, and we are so excited to come alongside Movement in ministry to countless people who need the Gospel community a church provides. Learning about the ways Movement Christian Church is meeting these needs has been so powerful for the two of us. Movement’s mission is to move closer to Jesus and people. Through intentional relationships and missional living, SO many people have moved closer to Jesus in just a few months! We were able to witness this during our week in Merrimack. Not only were four people baptized over the course of the weekend, but many in the worship group shared prayer requests for friends and family that don’t yet know Christ, but are clearly being pursued by Him. The culture at Movement is focused on bringing more and more people into the family of God. Just last week, Josh (the lead pastor) shared about a family that hadn’t ever attended church together. Since coming to Movement, they’ve decided to join a small group! He also told a story about a gentleman who has undergone relationship troubles since attending church. However, he told Josh that he was willing to follow Jesus no matter what the consequences would be. These people are passionately in love with our Lord! They are serving Him and loving Him with their whole hearts. Not only is Movement working to reach people spiritually, but they also run a food pantry each week where neighbors can come and shop fresh meats, dairy, fruits, vegetables and other goods. These friends are treated with dignity and respect. Part of my role as a resident will be to figure out other ways for Movement to become more involved with meeting the needs of the community, whether through the food pantry, a local homeless shelter, foster care and more. God is clearly moving in New England, and has been for years. Now, we can move with Him! We are able to pack up our bags and move to the Northeast, but we recognize that most simply cannot do this. However, each of you reading this post also has an opportunity to join in God’s work! We need help. We need your prayers; for us, for Movement, for the people in Merrimack who need to know Jesus. We’re also in the process of raising financial support. Our goal is to raise $2,000 dollars per month. starting in September. This would fund our living expenses and allow us to devote our time to investing in the people we get to meet. 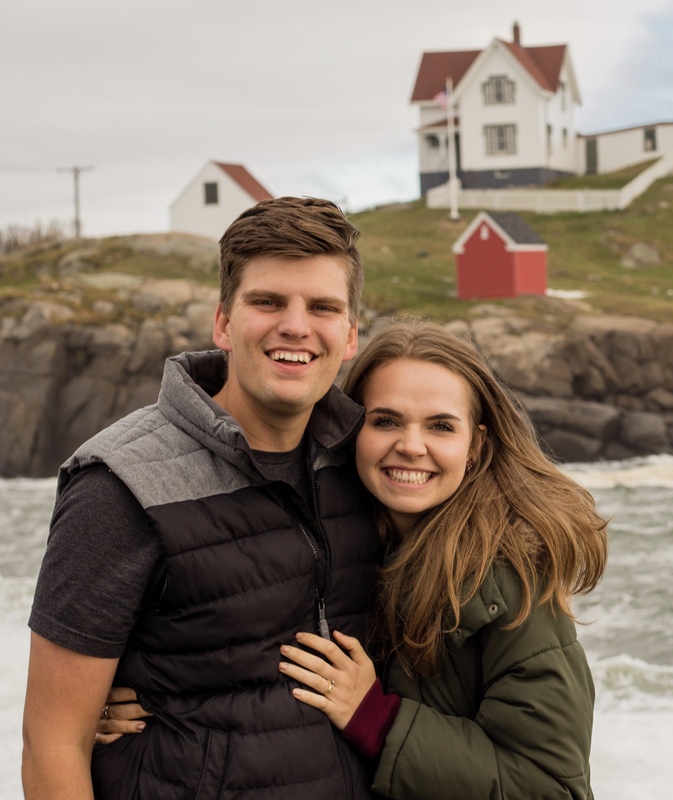 While the finances are important to us, our hearts are mostly excited to get as many people involved in what God is doing in New England as possible! We want to inspire and captivate you with the ways Jesus is already at work there. If this leads you to give a one time financial gift or partner with us each month, we would be so thrilled and grateful! If you’re already committed elsewhere or can’t spare the cash, then please pray with us! God is so powerful, and He hears each of our prayers. If this is something you’re interested in or want to hear more about, please reach out to us! You can email us at reventuring1@gmail.com. If you want to give financially, clicking here will take you to Restoration House’s (the church planting organization we’re working with) website. Please specify with “Rhett and Elisa” in the memo. If you want to commit to praying with us or supporting us regularly, clicking here will let take you to a quick and easy form that allows you to join our team! For a list of prayer requests and answered prayers, please click here. We are so thankful. We are thankful that God is giving us this opportunity and that He will provide for us. What a joy that He chooses to use silly little people like us to bring His great plans to life! We are also thankful for each one of you who is on this journey with us. Today, we pray that you would feel His love and power in your own life, in ways that best make sense to your heart. If you’re reading this, let me first say “Thank you!” for checking out or following along with our blog about God’s big plans and our little selves. We are so excited for what the next chapter in our lives has in store for us. But before we look ahead, I’d like to look back and answer one question in particular; how did we get here? This story begins early last April, when our thoughts were far from post graduation plans and even further from New England. It was the time of the semester where there is a bit of a lull before major papers and finals start coming due. I had taken advantage of the slow pace by deciding to take a day trip to see a St. Louis Cardinals game with a group of friends and professors. You see, while many graduating seniors were scrambling to secure future plans, Elisa and I were confident in our choice to move to Indiana. Elisa had been offered a perfect job and we were looking forward to being closer to family. While we were still waiting on a few things to fall into place, we felt so secure that we had just turned in 30 day notices to both of our jobs and our landlord. Just as I was about to leave for St.Louis, I got a call from Elisa, and suddenly we knew our plans were needing to be reevaluated, if not completely changed. I was only able to have a short conversation with Elisa before climbing in a 12 passenger van and spending a long day of both nervous prayer and confusion juxtaposed against the experience of my first MLB game with a great set of friends. I arrived home very late that night and because of our busy work and class schedules, we were only able to come to the conclusion that we had no idea where we’d be living in six weeks and that the odds of us both finding opportunities in our fields of ministry were basically zero. We felt stuck. Just two days after things changed for us, I had to leave home with CIY’s traveling conference “Believe.” We still felt completely helpless. What was God doing? Didn’t He know that His timing couldn’t have been worse? Is He somehow punishing us by making us go through the stress of yet another job search? These thoughts swirled in our heads as I left, but we knew that the only place we could turn, and the only we place we really should ever turn, was to the Lord. So we spent the next few days fasting and praying for God to move. Spoiler alert: He did. After two days out on the road, working long hours and blasting my resume out to the four corners of the map, I was the antitheses of “calm, cool, and collected.” I took a second between conference sessions to look at Facebook, a constant relief to those seeking distraction. When I pulled it up, I had a message from an old friend and role model, Josh Adsit, wanting to catch up. I told him a bit about what had happened and he was FLOORED. You see, Josh and the staff at Movement Christian Church were praying for God to send them people to join them in what He is doing in Merrimack. We soon set up a time to talk about possibly moving to New Hampshire and joining Movement as residents. When we sat down to talk, they told us about how Movement had gone from a core group of around 50 to over 250 people! They asked us what our dream roles would be. I told them that I’d want to be jack-of-all-trades minister, with the chance to work as a supporting minister in the creative arts, youth, and teaching ministries. Elisa said that she would want to work to help connect the church with local nonprofits to meet the needs of the community. They were elated. The church was in need of another hand on deck to support the three ministers, and they were dreaming of ways to make missional living a part of the church’s DNA. We were a PERFECT fit! During that call we also figured out that the SAME DAY that God changed our plans was the day that the team at Movement started praying for Him to send them fellow workers! While we were worried that we had no plan, God was placing us EXACTLY where we were supposed to be! This has been affirmed time and time again, through our trip to New England and many conversations with friends, family and the staff and members of Movement Christian Church. Now that you know how we got here, I’m so excited to be able to continue sharing this journey with you as we move into the future! So many of you have reached out to us with encouraging words about our site and our upcoming move. It has been an honor for us to express ourselves and tell our story in writing. Elisa and I are both so grateful for you and for this season. Come Thou Fount is one of my very favorite hymns. My sweet summer spent in Yellowstone gave me a renewed appreciation for many things; hymns are just one of them. While I enjoy newer songs, singing words to Jesus that have been used to worship him for years and years is so precious. Leading worship in the mountains, using mostly older hymns, solidified this truth in my heart. Come Thou Fount is one of my favorites, because it reminds me of who God is and just how much we need Him. Each word seems to call out to Him in both praise and longing for redemption. While these words are surely full of familiarity and comfort to some, they probably sound foreign and strange to others. This song reminds us that although Jesus is always pursuing us, we are easily distracted and tempted by things that aren’t nearly as good as he is. Even so, we long to return to God and allow Him to hold our hearts. I don’t know about you, friend, but I am surely prone to wander. The title of this post could just as easily be the title of a memoir about my life. Moving around so much as a child taught me to be on the constant hunt for anything new- a new experience, a new friend, place or sight. While this is often a strength, it can easily develop into restlessness and discontentment as my curiosity takes me on paths away from God’s design. Being prone to wandering doesn’t have to be a bad thing, but when it leads me away from the God I love, it can end in nothing but destruction. It can be easy for my “wandering” heart to lead me to sin when I sacrifice my commitment to Jesus for lesser experiences. During our trip to New England, Rhett and I had time aplenty to really wander; not toward sin, but through travel! Josh and Mark, two of the ministers on staff at Movement, sent us on our way in a rental car full of gas. They wanted us to fall in love with the area we’re moving to, and this couldn’t have been a better way for us to do so. Rhett and I were able to explore to our hearts’ content and take in all the beauty the Northeast has to offer, from a curvy mountain highway to a lighthouse on the coast. I’m not gonna lie, we had a ton of fun and made memories we’ll be able to treasure for the rest of our lives. As someone who loves to travel, this was a dream come true. Travel is often a privilege and I am so grateful for our ability to drink life in through such a magnificent straw. But at the end of our time exploring, I was reminded that I have not been created to find contentment in my wandering, whether it’s through physical travel or something that might be sinful. As thrilling as it is, I wasn’t created for airplanes or road trips or new food and new songs. I may love the feeling of blustering wind on my face as I gaze at crashing waves, but this does not satisfy or fulfill me. Neither are we satisfied in jealousy, anger, cutting words or idolatry. Rather, I have been created to find wholeness in God and God alone, and so have you. Traveling is amazing, but it should only lead me to hunger after the Lord even more. I pray that God might take my heart and seal it for Himself. Today, I pray this for you as well. Of course, our trip to New Hampshire was about so much more than experiencing the landscape of New England. We were able to attend church and several meetings, allowing us to meet so many new friends and get a taste of Movement’s community. Although we were only there a few days, we have come to love Movement dearly and we cannot wait to be back. We are so grateful for each and every one of you, whose kindness and welcoming hearts made us feel so encouraged and loved. Thank you. Right now, our lives still feel a bit unsettled. We’re in Tulsa for the month of June, traveling some more for most of July and then we’ll be with my family in Indiana for August until we move to New Hampshire. Everything we own, save for some clothes and a tent, is packed away in my family’s garage. Although I love the transition new experiences have to offer, and I am so incredibly grateful for this time and our amazing families, I am also looking forward to being more stable come fall. Sometimes we’re prone to wander, and sometimes life puts us in seasons where wandering is inevitable. Either way, God is always, always, always calling us to Himself. Let us constantly allow our wandering to lead us back to Him. Joyfully exploring the White Mountains near Lincoln, New Hampshire. As I sit down to write this, days later, we are still recovering from one of the most incredible weeks of our lives. Elisa and I had the chance to fly out to New England and get to know the people and the place that will so soon be our family and our home, and in so many ways already is. We touched down in Boston at 1:30 A.M. on Thursday morning and from that moment on we were launched into a whirlwind week full of new experiences, faces, names, sights, tastes and joys. Being a mid-west boy who was born, raised, and educated in cities within 2 hours of each other, I discovered so many wonderful things while in the northeast. I learned that shrimp have legs, that they are sometimes served with legs, and that I should be excited about that. I learned that it’s “Dunkin” Donuts, and there isn’t a billionaire breakfast tycoon named Duncan. And I learned that they call sprinkles “Jimmys” but they taste the same when sprinkled (or jimmied?) on my ice cream. Of all of the different new things I learned and experienced this last week, there were some very important things that were the same as what I’ve grown up surrounded by. I was able to gather with my new friends and worship the very same God that I worshiped in Missouri and Oklahoma. God loves the people in New England with the same powerful, amazing, redeeming love that I have seen my whole life. I saw the Holy Spirit move with It’s same unspeakable power and beauty as I have seen in my childhood, and the truth that Jesus Christ came to earth to redeem and restore every soul back to relationship with Him still stands. Jesus is desperately, head-over-heels in love with the people of New England, and I was so blessed to meet a wonderful, loving, welcoming, crazy group of people who love Him right back, and who long to see all of New England come to know Jesus like they have. Throughout the entire world, God is moving closer to His people and inviting them to move closer to Him. I am truly humbled that I might spend my life moving closer to God and others as He continues to bring His lost children home to Himself. All praise be to our God who moves.